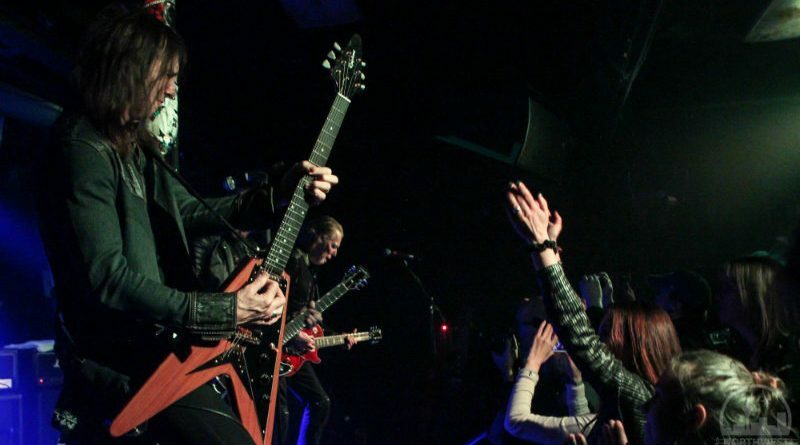 Even though the crowd was a little sparse at El Corazon in Seattle on Monday night you’d be hard pressed to catch even a hint of that from the headlining band, Black Star Riders. The previous night they played to a sold out Showare Center in Kent in the opening spot for Judas Priest‘s Firepower tour. 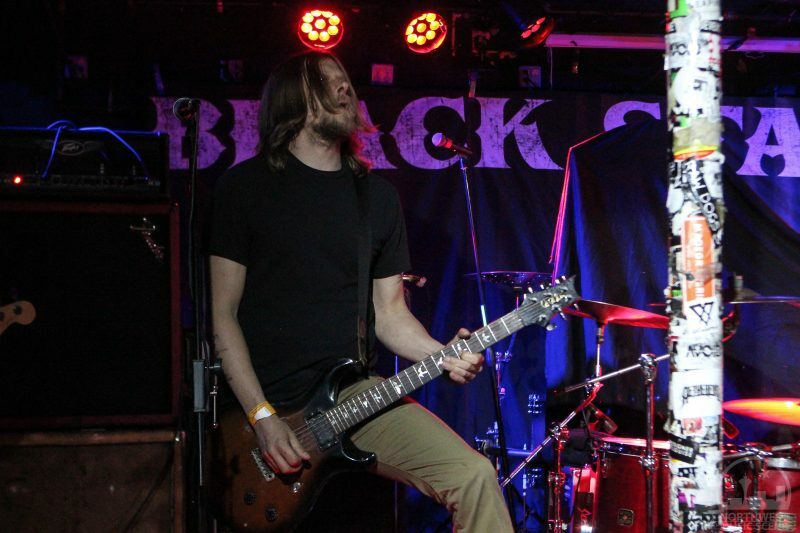 Their Sunday set in Kent was the typical abbreviated opening romp , whereas Monday’s show at El Corazon would be the full setlist and plenty of time to rock some faces off. Which they did and then some. Motogeist opened the Monday night show at the historic Seattle rock venue and they definitely brought the heat. If Motorhead and Zeke had a baby it would probably sound something like Motogeist, (thanks for the line Jeff) with perhaps just a bit more early 80’s thrash thrown in the mix. The band is made up of ex-members of such northwest heavies as All Bets On Death, The Insurgence, Sledgeback, Himsa and although they only formed in 2016, they are tight as hell. After Motogeist, local favorites Zero Down took the stage bringing a few more people on to the floor in front of the stage. The band dug into their arsenal of groove-heavy metal bangers and coupled with their energetic stage presence got the crowd completely pumped for the headliners. Part punk, part metal and all that rocks, Zero Down has been causing heads to bang at will since 2002 and they clearly have this music thing down to a science. By the time Black Star Riders took the stage, the club had a few more people in it but it was still fascinating to think about the night before where they were in front of around seven thousand screaming metalheads compared to the 70 or so that ventured out on a Seattle Monday night. There no doubt would have been more bodies had there not been a big show on Sunday but all that being said, the band didn’t mind a bit and they delivered a monster set with the same intensity that they did at Showare. 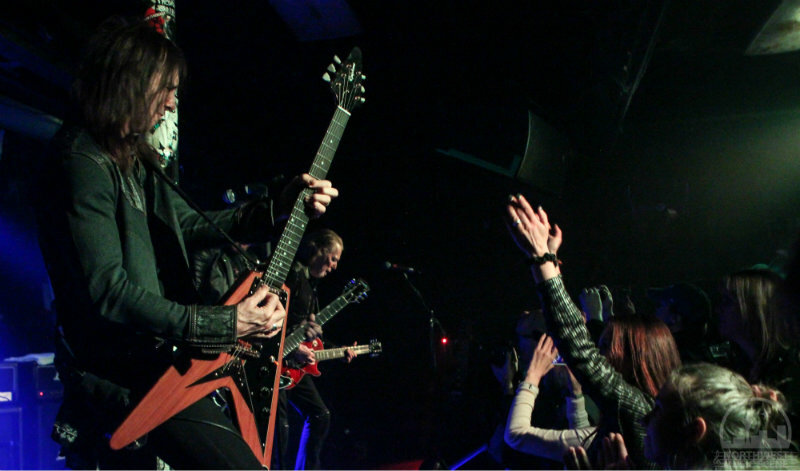 Black Star Riders are made up of former Thin Lizzy guitarist Scott Gorham, Brother Cane founder, guitarist Damon Johnson, singer and guitarist Ricky Warwick (The Almighty), bassist Robert Crane (Ratt, Lynch Mob), and drummer Chad Szeliga (Breaking Benjamin, Black Label Society). 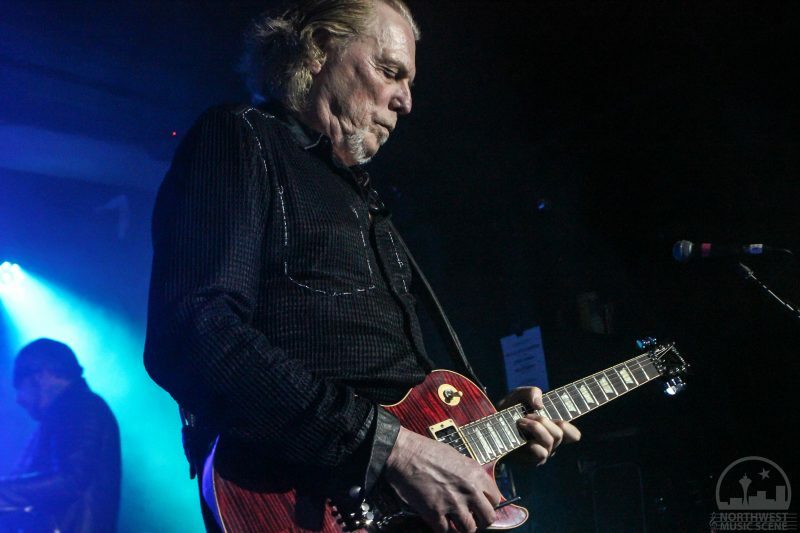 The band got it’s start as a way for Thin Lizzy guitarist Gorham to record new music. 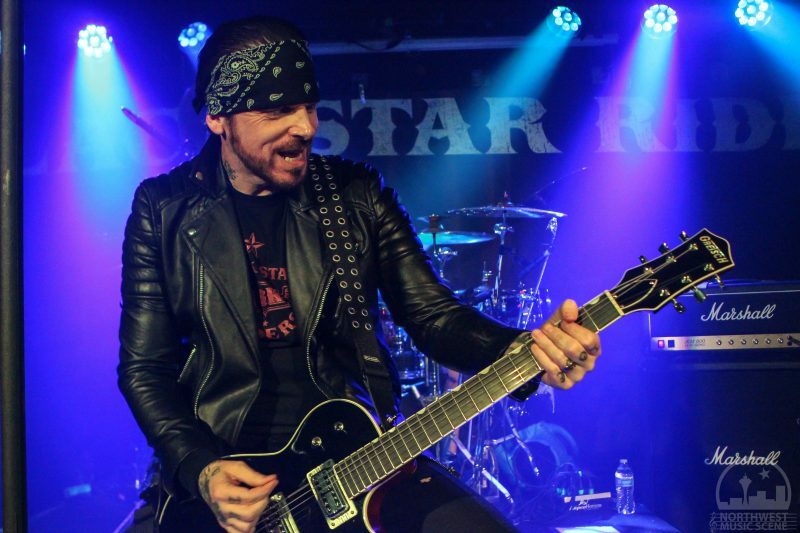 Rightfully not wanting to record under the Thin Lizzy moniker, Black Star Riders was born around 5 – 1/2 years ago. To say they sound like Thin Lizzy pretty much goes without saying but you have to see them live to grasp how much Warwick sounds like the legendary Phil Lynott, who Warwick paid ample homage to from the stage. Growing up in Belfast, Ireland and being a rocker I guess you HAVE to love Thin Lizzy and Warwick fits the roll perfectly. Europe is my biggest idol since I was a teenager (80’s). I like many other rock bands (Stryper, Def Leopard, Poison, Whitesnake, Van Halen, Mr. Big, etc. etc…) but Europe has always been my #1. And Europe was the only band I’d travel abroad to see, until I discovered BSR, when they co-headlined with Europe in UK in 2015. So, in March 2015, I went to UK to see three shows of Europe. And at the first gig I saw BSR for the very first time, and just got a crush – they were amazing. I knew of course about Scott from legendary Thin Lizzy, but not about the other members. But to understand the music I didn’t need to know their background- I just loved their performance so so much. Really overwhelming. So I saw them 3 times there. After that, in April, I went on Monsters of Rock Cruise, where I saw a lot of cool bands, amongst all Europe and BSR! So, I saw BSR twice on the cruise. Then, after that, the year of 2015 became a tough one for me in my personal life…. I kind of lost energy to go abroad to see Europe (when they toured with Scorpions) when my friends were going. I was fighting in my mind if I should take courage to travel…meanwhile I found out that Ricky was trying to record an album of cover songs on Pledge Music. I really wanted to make it to the goal so that he can release it and we the fans enjoy his music. And, I just couldn’t help choosing the “Belfast tour with Ricky” there… I asked my partner in crime (Mei from Taiwan but currently lives in UK), who is also a big fan of both Europe and BSR, if she wanted to do the tour together. So, we did! And that gave me the courage to go abroad again. So, after spending some relaxing days at Mei’s place, we flew to Belfast. Ricky did a wonderful tour for us – we believe he took it very seriously that we really wanted to support his project (and yes it reached the goal!). He showed us many places that meant a lot to him, that gave him inspiration when writing songs, where he used to hang out in childhood, etc. After the private tour we saw BSR (with Whitesnake and Def Leopard) in Belfast. Then, I flew back to Japan happily. But after knowing BSR’d have a headlining Christmas show in Wolverhampton like a week (or 10 days?) after that, I was really getting greedy – I wanted the whole show (I mean BSR headlined show). So, I just broke my record of “shortest stay abroad” – I flew back to UK just to see that Wolverhampton show, stayed just for one night and went back to Japan…. that was one of the most memorable shows of BSR I may say. And I don’t think I wasted anything. Discovering BSR was probably the only good thing that happened to me in 2015, and it meant a lot to me. You know there are some turning points in your life- for me one of the point was 3/11 in 2011, when the tremendous earthquake and tsunami hit East Japan. I was in Tokyo but did experience the biggest shake of my life – I thought I was gonna die. After that I went to the tsunami disaster areas for some aid. In the beginning people were needing food, shelter, clothes…. but later, they needed something else. They needed something to feel happiness to have survived, though they’ve lost a lot of things – family, friends, houses, whole towns…. Music was one of the things that brightened up and cheered up their lives. I seriously think music has such a magical power. It doesn’t make your stomach full, it doesn’t shelter you from rain or snow, but it gives you energy to carry on and go on. Going back to my BSR story – in 2016 I saw Warwick/Johnson unplugged twice, in May in Denmark, in July in UK, before the Ramblin’ Man Fair (music festival) where Europe and Thin Lizzy played. Also Dead Daisies (with Marco [Mendoza], ex-bassist of BSR), Whitesnake… great festival it was. Then in 2017, March 11 & 12 I saw BSR in UK (that was for my birthday- March 12 – 11th in UK was 12th in Japan and 12th in UK was 12th! ), then, finally in Japan in October at Loud Park (the biggest hard rock/ heavy metal festival in Japan). And this year, Kent, Seattle, and Portland so far. I’d love to see them later this year again if they announce the tour dates and some dates fits my schedule. The Seattle show last night became one of the most unforgettable ones!! It was so intimate! BSR mixed up their set with their own newer original music but played a blistering, spot on version of “Jailbreak” from Thin Lizzy’s 1976 album of the same name. That set the tone for the night and even if they’d have sucked after that no one would have cared. But they didn’t, it only got better from there, not an easy feat. At times throughout the set Warwick took time to explain the history of the band and the history of the some of the songs. Songs like “Hey Judas,” which since it was written during a European tour with the metal gods (Judas Priest) a few years ago, seems like it might be about Priest but it’s not, explained Warwick. It’s about a family member making terrible choices but is still loved by all in spite of that. Aside from the obvious similarity to Thin Lizzy, they have a few other tricks up their sleeve to keep their sound fresh, like the bluesy “Ticket To Rise” reminiscent of Cream’s version of “Born Under a Bad Sign” and “Kingdom of The Lost” that pays homage to the Irish influence of the band while mixing in a solid relevant rock vibe, it’s a unique sound that not many bands could pull off. When they played Thin Lizzy’s “Boys Are Back In Town,” the crowd went pretty crazy again and they didn’t disappoint with that version either. 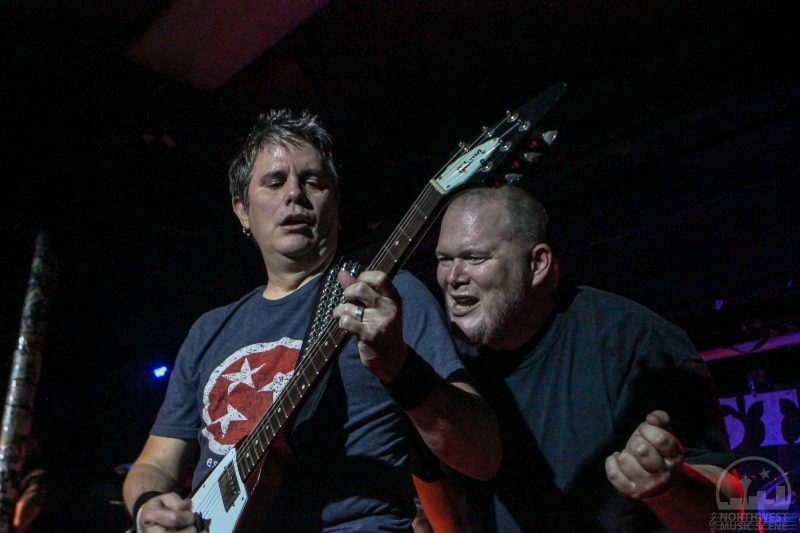 One thing to note about the band is that they have an obvious camaraderie between them and the music feeds off the closeness of the members, which probably helps when you are trying to get three guitars to work in unison. Most of the crowd stuck around until the end and those that did were rewarded with an incredible show. Can’t wait to see them again in the northwest.